Original Mega Man char is 24 pixels high, mine is 32 pixels high. I tried creating a smaller version, but it doesn't look as cool as my tall one. Now my question is, how will a 32 pixels high char play in a world of Mega Man? Will platforming still work good with the same physics as normal mega man? Or will some trouble appear because he's 32 pixels high instead of 24? 2. You are much larger and bullets will hit you more easily. The second one is a larger problem, because even with crouching, you'll probably not be able to move while crouching, which means that while you're moving you're more vulnerable than mega man. Apart from that, it looks great. You can in fact mix those two versions, the simple megaman (middle one) sticks out more and works good as the protagonist, while the other two guys look NPCish (they "blend"). Please animate him. (animate - to give breath to something? great word). He looks like he wants to be alive, and he definetly wants it. Although I must admit he doesn't remind me of megaman much. or make his projectiles bigger, also being bigger target is tied into the balance of the game, it's all relative to the amount of damage you recieve and health you have, and whether the bullets have a throw back stop your action type mechanic like in some mega man games, so I wouldn't think about those critiques as absolute issues and more of things you should think about if you make the game. unless you do just juxtaposition this character into an existing Megaman game without rebalancing anything, but that'd be daft. which brings my next question what on earth is that thing going on between their legs??? I like the direction the designs are going in otherwise, but some things aren't readable and a few pixel here and there seem bizarrely placed, bad quick edit simplifying and with a lame pose, no adjustments to proportions. where is his blaster arm btw? *holy hell wait is that a blaster dong? Finally some serious constructive critique! My char is supposed to be a mage rather than a robot. I'd like the game to play just like a Mega Man game but instead everything is played out in a world of magic. So he's supposed to wear some robearmour of some sort. But I guess it's hard to read I'll try to revise it. So he'll be shooting his spells from his hands. Actually I prefer him to wear a spellbook, but it's hard to make it readable. As for the tiles, they're old stuff. I'll revise them and make them more in the NES-palette. Ie simplifying alot. When i think of wizards. i think of beards. Stick a beard on it maybe? It sounds very simplistic of me but it could be a cheap and effective way of differentiating the three characters. There I made him more mage alike... How's this? Everythingr readable? What part of megaman do you want to "-esque" with your character? Is it the size? the style of the eyes? or the fact that he is a cyborg? For me, megaman is about coloured metal plates and a human head. It looks like the wizard has cloth. Does this matter to you? There is also more detail on the wizard than on the megaman next to him. It's readable alright. But i don't think he needs the cape. The huge pointy hat kinda signals his wizardry enough. 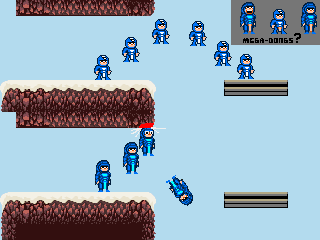 Basically by megaman the game I'm trying to do will have similar gameplay like Mega Man. So I'm trying similar style for the sprites etc. But my world will be played out in a world of magic instead of one with robots. So instead of the main char being a robot, he'll be a mage. Not one of those older mages with beards, but more of an apprentice of some sort. I'll just use ONE of the sprites in this pic. I still haven't decided on which. Mega Man himself uses only 5 colours: Black, White, Skin-color, Blue, Teal.